DeWalt DWX723 vs DWX724 which miter stand is the right choice? If you are in need of a new miter saw stand and are looking for some lightweight and portable options​ then the DWX723 and DWX724 from DeWalt are a pretty good bet. Although they may not be a maneuverable as a rolling miter saw stand once set up they are however a lot more portable between jobs and take up a lot less space once the legs are folded up. The DWX723 miter saw stand from DeWalt is a sturdy thirty five pounds in weight and can support up to a maximum of five hundred pounds. ​It has a five and a half foot beam. Fully extended the DWX723 can support material up to sixteen feet in length. ​The DeWalt DWX724 is somewhat smaller than the DWX723. It has a slightly smaller frame at forty inches and can hold up to ten feet in length. The DW724 weighs in at roughly 30 pounds making it five pounds lighter than the DWX723. However, it has the same maximum weight rating as it's bigger brother the DWX723 at five hundred pounds. ​Both models are essentially the same when you look at the them from a feature perspective the only major difference between the DWX723 and the DWX724 is that the 723 is somewhat larger. ​DeWalt DWX723 vs DWX724 which one is the winner? Looking for a new router table and unsure of which Kreg model is best? In this Kreg router table review we will look at the PRS1045 and the PRS2100 the two current offerings. The PRS1045 is the larger stand type router table and the PRS2100 is the bench top router table offering from Kreg. There are of course plenty of alternatives to the two Kreg models listed here. Bosch have two of the most popular models with the RA1171 and﻿ RA1181. 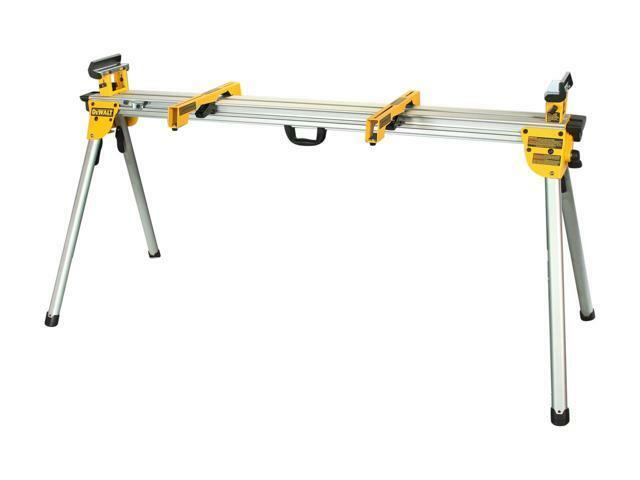 The Kreg PRS1045 is a rolling table shop stand with integrated router table top. It would best be described as a cabinet style router table. All the major components that make for a great router table are included; the fence, two featherboards and the table top. ​The fence is automatically squaring as it is a t-square fence ensuring it continues to stay parallel to the miter slot. It is built from perfectly square aluminum and can be adjusted easily in small increments making it very suitable for a beginner to use. ​The table top is MDF that has been reinforced with twin steel struts helping to keep it warp fre and true. The MDF is topped with a "Easy-Slide" surface making it easy to move your work pieces into position. The insert plate is about as simple to use as a insert plate can get. Your routers base plate inserts easily thanks to an included template that should fit the majority of modern routers. The stand comes with 4 coasters for easy manovering around your wood shop. They are also locking coasters so you can be sure that it'll stay in place on parked in the right spot​. If you happen to be on uneven ground each leg is adjustable giving a range of work height for the table from 31 inches to 36 inches​. ​The Kreg PRS2100 is a benchtop router table that is capable of accepting some very large routers unlike a lot of other benchtop router tables. The fence is locked in place via cam lock lever clamps to help keep it safe and secure. The combination of sturdy steel frame, rubber feet and open design helps to keep noise and vibration to a minimum . Who is the Kreg PRS2100 for? It is suitable for beginners and those that are on a strict budget or are stuck for space. 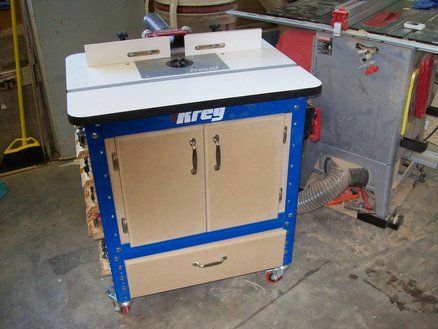 ​It is a well built mid-range router table that should last many years of use in your wood shop. So there you have the two main offerings from Kreg.​ Each is aimed at a particular type of woodworker. Given the price of the PRS1045 it may not be suitable for a beginner. 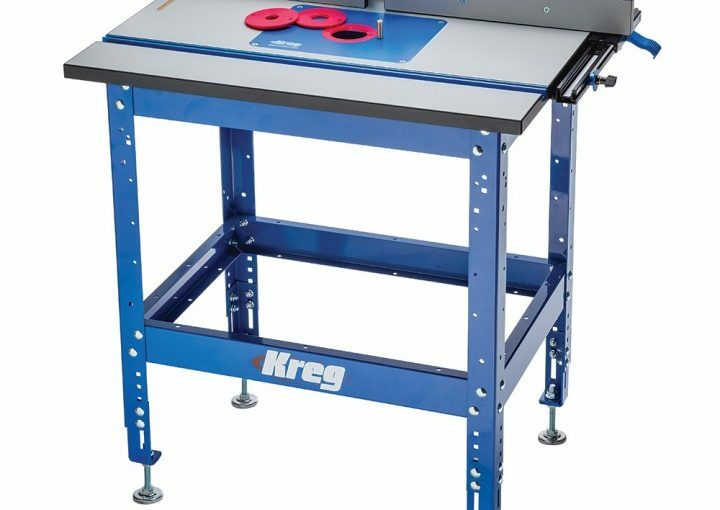 If however you are looking for an easy to use cabinet style router table that is highly adjustable and comes with a T-Square fence then the Kreg PRS1045 is one of the best router tables available. ​The PRS2100 on the other hand is one heck of a router table if you are just a beginner or can't justify the space that the PRS1045 may take up. It is certainly a more cost effective alternative to the bigger 1045 and if you are just starting out or only do the occasion bit of routing then the PRS2100 is a great buy for any wood shop or home garage setup. 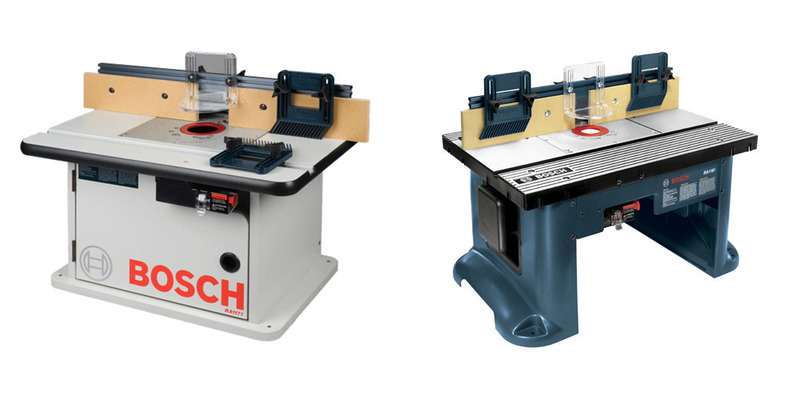 Bosch RA1171 vs RA1181 which Bosch router table is right for you? With the RA1171 and RA1181 Bosch have pretty much dominated the budget friendly router table market. There are of course much more expensive models available from other manufacturers like the Kreg PRS1045 and PRS2100​. The Bosch RA1171 is a cabinet style router table that has a smooth work surface area of 25 inch x 15-1/2 inch. The table top has a smoothed laminate surface ensuring that your work pieces are easly to adjust and slide about. The fence on the RA1171 is made from sturdy aluminum and has MDF face plates that can be used to for some fairly tall work pieces. Included are two adjustable featherboards that can either be ​attached to the fence or the table and are also adjustable. Design wise the RA1171 is the more traditional cabinet style router table. ​This design allows for superior dust collection versus the more open bench top format of the RA1181 below. To help aid dust collection the RA1171 has two dust ports that can be hooked up to any standard shop vacuum. There is also a dual outlet switch and comes supplied with a six foot power cord. Included in the box are: router table, 3 mounting plate insert rings, two adjustable featherboards, adjustable guard and 1/16 inch thick two fence shims. The RA1181 is the newer version of the RA1171 above. It has an open bottom design foud on similar benchtop router tables. The majority of the specifications on the RA1181 are the same as on the previous model. However, there are a few important differences between the RA1171 and RA1181. The leg supports on the RA1181 are made from molded plastic versus the all metal cabinet construction of the RA1171. This may put off a lot of people as they are naturally afraid of the plastic being easily damaged over time. However I have not heard of anyone having any problems with the ​plastic. The one advantage the plastic does have to offer is the reduction in weight versus the RA1171. The RA1181 weighs 30 pounds against the RA1171's 42 pounds. ​Bosch RA1171 vs RA1181 which one is right for you? The RA1171 cabinet style table is the older model and depending on where you buy is can be a little bit cheaper than the newer RA1181. The lighter RA1181 is probably best suited to those that need to move their router table from job site to job site. Being roughly 12 pounds lighter than the RA1171 it is much more portable. For a more permanent setup I would favor the RA1171 especially as the cabinet style base will give you much better dust and debris collection than the more open style of the RA1181. As you would expect both tables can easily accept the more popular brands such as Bosch and DeWalt routers ​so combat-ability should not be an issue. ​Both will perform as well as each other as from table top upwards they are essentially the same machine. Kreg R3 vs K4 which of these small pocket hole jig kits should you buy? If you are looking at trying your hand at some pocket hole joinery then using a pocket hole jig will make life a whole lot easier not to mention more accurate joins. ​The Kreg R3 is a two hole pocket jig that is capable of drilling in materials from 1/2 inch to 1-1/2 inches. Like all Kreg jigs the drill guides are hardened steel and come with a lifetime warranty. It has nine depth settings that are adjusted by changing the positioning sliders. Each depth can be adjusted by 1/8 of an inch each time. The R3 is suitable for small job and beginners who are looking to wet there teeth in pocket hole joinery. It is probably as simple as a pocket hole jig can get. ​Included in the kit is the two hole jig, 2 inch face clamp, plastic carry case, bit and collar guide. The K4 from Kreg is a three hole pocket hole jig. It can drill material from 1/2 inch to 1-1/2 inches. Included in the kit is the 3 hole jig, premium face clamp, ​bit and collar. There is also 500 1-1/4 inch screws. ​Kreg R3 vs K4 which on is better? Well the R3 is really only suitable for smaller jobs given that it can only drill two holes at a time. The K4 on the other hand is capable of drilling or screwing the self-tappers three at a time which will give a much stronger join especially on larger pieces. Kreg K4 vs K5 which jig kit is the one to buy ? ​Pocket hole jigs can help make a quality, square and more importantly repeatable join time and time again. They are used by cabinet makers and woodworkers of all skill levels. A pocket hole jig can be used as a substitute for biscuit joins or mortise and tenon joints. They are quick and simple to use and even a beginner can produce some high quality joins especially in more awkward spots. Kreg has a long history as a maker of pocket hole jigs. It's current range the R3, K4 and K5 all have ​subtle differences. You can see how the K4 fairs against the smaller model R3 here Kreg R3 vs K4. 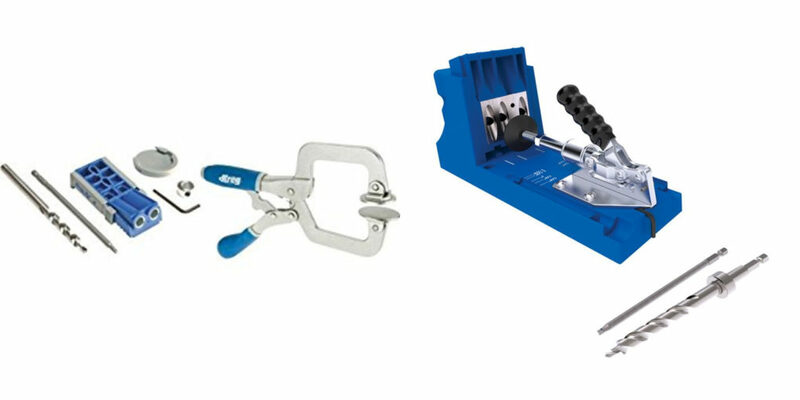 The Kreg K4 bundle includes the K4 pocket hole jig, face clamp and 500 1-1/4 inch pocket hole screws. The K4 is the classic design from Kreg that is quick and easy to use by just about anyone. It comes with a removable 3 hole drill guide and stepped drill bit meaning you can get started right out of the box. The 1-1/4 inch screws are designed ​specifically designed for pocket hole joinery. They have self tapping auger tips which eliminate the need for pre-drilling of stock pieces. The screws are best suited to joining 3/4 stock so if you are using anything else you may need to find the right sized screws to suit your needs. 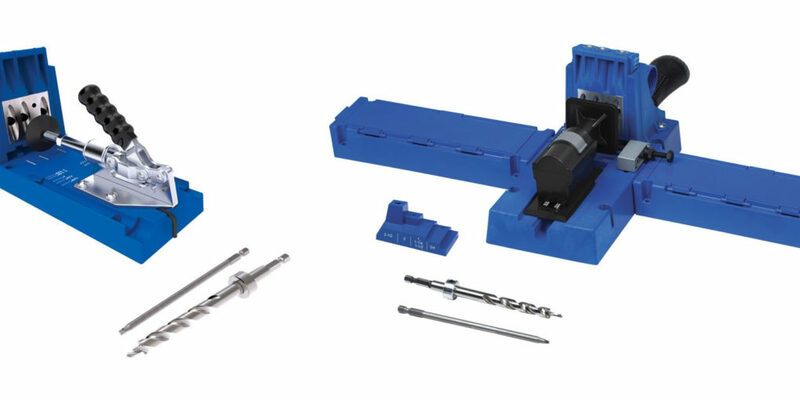 The Kreg K5 bundle includes the K5 pocket hole jig plus the SK03 pocket hole screw kit. The K5 is Kreg's latest model in its range of pocket hole jigs. With each new model there are small but well thought out improvements made and the K5 is no exception. With the K5 there has been a few changes over the K4. ​For those who may end up using the K5 a lot the addition of a dust port will help keep the work surface clean and help reduce dust about the wood shop or garage. The dust port should connect to any standard shop vacuum. One gripe about the dust port is its positioning on the jig. It can be ​a bit of a pain as it is between the quick release clamp lever and the general position of were you drill from. ​Kreg K4 vs K5 which is best ? The difference between kreg k4 and k5 is not that great in terms of functionality. The addition of the side wings for stability onto the K5 is certainly a nice feature if you are joining larger pieces and they also double as a storage solution for your screws.​ As too is the adjustable stop. ​Given that there is not a huge difference in price then I would choose the K5 over the K4 every time. Champion vs Honda Generator who makes the better portable inverter generators ? Honda and Yamaha have built a pretty solid reputation over the past few decades in the portable generator market. However, there are a new wave of brands that have started to gain a lot of traction recently. One such brand is Champion. The have a broad range of power units available the Champion dual fuel generators have really started to impress. That being said lets take a look at two model​ of a similar power rating one from each brand to see how they stack up against one another. We'll look at a small to medium sized portable inverter generator at around the 3000 Watt level from each manufacturer. The Champion 3100 is a portable inverter generatore that can produce a power output of 3100 Watts maximum. It can maintain a continuous power output of 2800 Watts. The 3100 is powered by a ​171 cc single-cylinder motor and has a 1.6 gallon gasoline fuel tank. It is capable of running for eight hours at one quarter load on a full tank of gas. There is also a low oil shut off sensor to help protect itself from running on low oil. The Champion has one 120 Volt 30 Amp RV outlet, two 120 volt AC standard outlets and one 12 Volt DC outlet. The EU3000i from Honda is a portable inverter generator capable of producing a maximum output of 3000 Watts and a continuous output of 2600 Watts. It has a 1.6 gallon fuel tank. ​With a full fuel tank it can run at full load for 3.5 hours and at a quarter load it can run for 7.7 hours. The engine size is 163 cc. It has a dry weight of seventy eight pounds and with built in wheels and folding handles it is pretty easy to move about. At the 3000 Watt size you are probably going to need a generator that is to move about and both the Champion and Honda are well covered in the regard. The EU3000 is also a pretty quiet machine and has a rating of 65 dB(A) at a rated load. ​Champion vs Honda Generator which one is right for you? Although Honda do have a hard won reputation in the generator market spanning decades it does not mean that the Champion generators are by any means lesser quality. ​Ultimately the choice will come down to price... Do you want to pay the hefty premium that Honda can charge for its generators based on its reputation. Bear in mind that the Honda is almost twice the price of the Champion and that can be said for almost all of the models at the different power options. 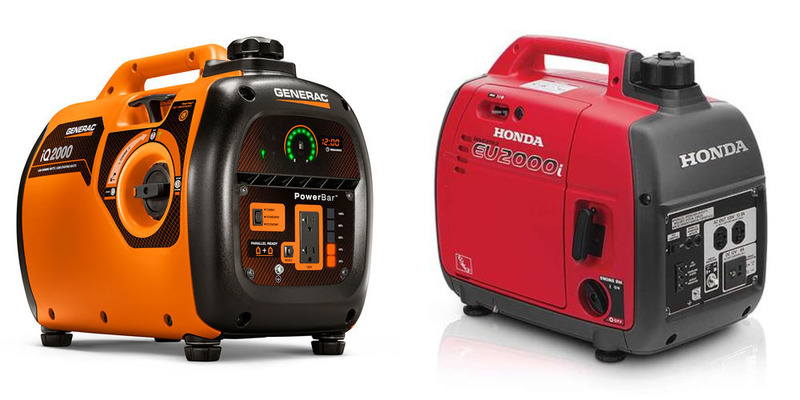 Generac IQ2000 vs Honda EU2000i which portable inverter generator is best and why? The Generac IQ2000 is a portable inverter generator that has a maximum load capacity of 2000 Watts. Under continuous usage it will produce 1600 Watt. It is powered by a 79 cc 4-strike engine. That engine will a run time of 5.7 hours at half load and 7.7 hours whilst running at one quarter load. There is a back-lit ​fuel gauge that saves you from opening the tank and peering. The Generac also has a number of extra displays that are quite useful: current burn rate, low fuel indicator, low oil indicator and warnings if the generator is about to either overheat or is becoming overloaded. ​There are two 120 Volt AC outlets, however the omission of a 12 Volt DC outlet is a major negative point with the Generac. The EU2000i from Honda is a portable inverter generator that is powered by a 98 cc motor. That motor can deliver 2000 Watts of power maximum or 16000 Watts during continuous usage. Fuel capacity is 4.1 liters giving a run time of four hours at full load and up to ten hours at one quarter load.​ Un-fueled it weighs roughly 45 pounds. Just like the Generac the Honda is parallel ready and you also would need to purchase the parallel kit separately. Generac IQ2000 vs Honda EU2000i ​which is the winner? The Honda has also been around for quite sometime and in that time it has gained a reputation for high reliabilty some thing that is paramount to have in a generator especially in a storm or other emergency scenario. 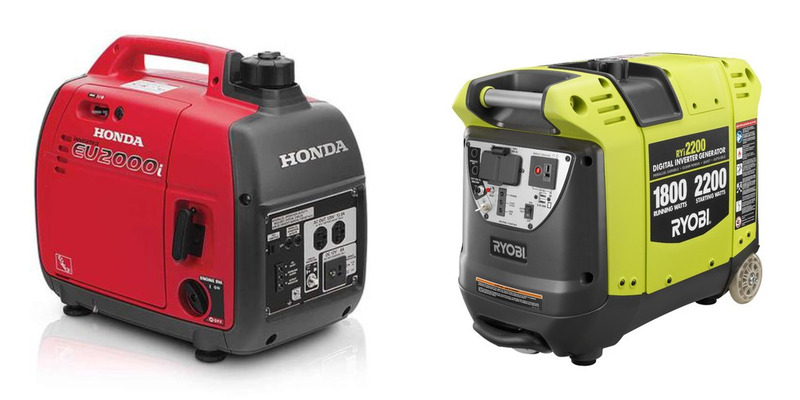 Honda vs Ryobi Generator which makes the better portable units? If we are to compare the two brands it is best to look at their two most popular models.​ Undoubtedly the smaller sized generator of around 2000 Watts are the most popular. They are used by people in the outdoors and on busy job sites. Those looking for more power and who still want to be able to lift each unit on their own can always run two of the same units in parallel. For Honda their most popular model is the EU2000i and for Ryobi it is the ​RYI2200. Lets take a brief look at both models on their own and then compare them at the end. ​The Honda EU2000i is a small form portable inverter generator that has a continuous load rating of 1600 Watts at 13.3 Amps. It has a max surge rating of 2000 Watts at 16.7 Amps. With a fuel capacity of 4.1 liters the EU2000i can run for 10 hours at a quarter load. At full load it can run for up to four hours.​ Powered by a 98cc engine the Honda has an empty weight of 45 pounds. As with most portable generators of this size the Honda has two 120 AC Volt outputs and one 12 Volt DC​ which is what you would consider as standard these days. 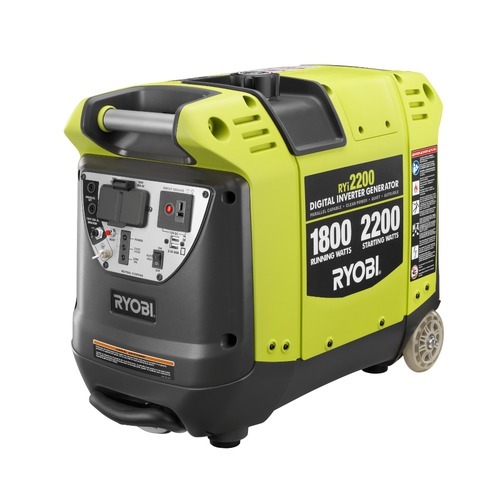 ​The Ryobi RYI2200 portable inverter generator is capable of a maximum power output of 2200 Watts. For continuous use it is able to maintain 1800 Watt. It has one 12 Volt DC outlet and two 120 Volt AC outlets. ​The 12 Volt DC outlet has a circuit breaker. There is also an automatic idle switch that will idle the motor until there is a load placed on the generator. Ryobi Generator vs Honda ​what is the difference and which is best? ​The Ryobi is usually priced at the lower end of the market and they are considered a decent choice if you are on a strict budget. That being said prices have started to creep up for these units so the more expensive they get the less desirable an option they are. Honda EU2000i vs Yamaha EF2000is which inverter generator is best ? If you are in the market for a new lightweight portable generator then you will be aware that there are quite a few available. 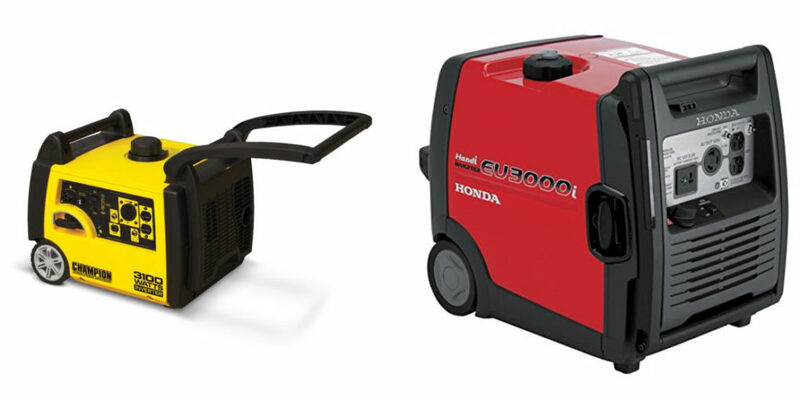 In the 2000 Watt market segment the Honda EU2000i and Yamaha EF2000is are by far the most popular. The Honda EU2000i is a portable inverter generator that has a maximum power output of 2000 Watts at 16.7 Amps. For continuous use it is capable of producing 1600 Watts at 13.3 Amps. The EU2000i has a full capacity of 4.1 liters and can run at full power for four hours. At a quarter load if can operate for up to 10 hours.​ It has a 98.5 cc engine and weighs roughly 45 pounds without fuel. It comes with two 120 Volt AC outlets and one 12 Volt DC which is fairly standard on these sized generators. Like a lot of these smaller units it is possible to run the Honda in parallel with another one to double you power. The main advantages to having two smaller generators in parallel as opposed to one large one are portability and redundancy. A single person can lift one of these units however they may not be able to lift a generator twice its size. Having two means that if one goes down you still have power from the other unit albeit at have the power. ​The Yamaha EF2000is is a 2000 Watt portable inverter generator. It is capable of producing a maximum output of 2000 Watt at 16.7 Amps. For continuous output it can produce 1600 Watts at 13.3 Amp. The EF2000is has a fuel capacity of 4.4 liters giving it a run time at full load of 4.2 hours and at a quarter load 10.5 hours depending on the quality of fuel used. It is powered by a 79cc engine and has a dry weight of 20 kg or about 45 lbs. The Yamaha has a separate shut off switch for the fuel unlike the Honda. The ability to run the carb dry means you can store the generator without fuel in the carburetor . Allowing old fuel to lie in a carburetor whilst it is stored for long periods can mean starting it becomes a chore as the old petrol will not ignite as easy as fresh petrol. The EF2000is also comes with ​DC battery cable for charging 12 Volt batteries and an integrated fuel guage, the Honda however does not. There is also an oil watch warning system to help reduce the chances of damage from low oil levels. Both manufacturers offer different models of varying power and have gained a huge amount of trust over the past few decades as to the reliability and performance of their models. Honda vs Yamaha generators which is better? From a brand perspective both share the top positions in the market right now. Both offer the same types of three year warranties and are at roughly a similar price point. It is only when you pit individual models and sizes against each other do the differences arise. Below we look at the difference between the Honda EU2000i and Yamaha EF2000is. ​Honda EU2000i vs Yamaha EF2000is just which is better? ​All of the above add up a give the Yamaha the edge over the Honda. However if you see the Honda generator on sale then those added extra's may not be worth it and I would buy the cheapest given that they both perform similarly. Fluke 115 vs 117 | Which Multimeter ? Wondering what the difference is between the Fluke 115 vs 117? The 115 and 117 from Fluke are their entry level multimeters that form part of the 110 range. They are aimed at domestic use and light industrial usage for professionals. The Fluke 115 is an entry level digital multimeter that is perfect for hobbyist/DIY and light professional usage. Like most Fluke meters it is accurate, well built and comes in quite a durable housing. ​The 115 is a compact true RMS digital multimeter and is capable of accurately measuring capacitance, continuity, current, resistance, and voltage. It can measure up to 600 Volts AC/DC, frequency up to 50KHz, 40MΩ resistance and continuous amperage up to 10 Amp. ​Just like the 115 above the Fluke 117 is a digital multimeter that is aimed at light industrial use and the home DIY'er or hobbyist markets. It is also a true RMS meter and shares a lot of the standard multimeter features that you also find on the 115. The 117 also has Auto-V/LoZ functionality and non-contact voltage detection. The LoZ helps to screen out 'ghost voltages' from nearby circuits ​whilst the "Volt-alert" is the non-contact voltage detector. ​So with the 117 you get the top of the line in the entry level 110 series from Fluke. ​So which should you buy then the Fluke 115 vs 117 ? 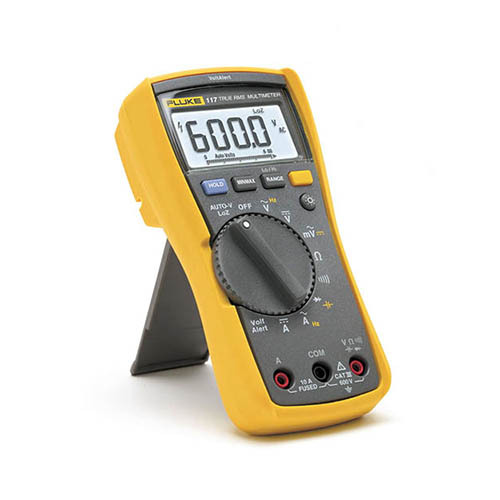 Ultimately they are the exact same true RMS multimeter with lots of good features and a very high build quality. The 117 however does have the added ghost voltage detector and the non-contact voltage detector. The decision then should be primarily based on whether or not you need either of those two features. If you do then the Fluke 117 is a very well featured and affordable multimeter. If you don't then you can save yourself a small bit of money and just opt for the Fluke 115.